Editor’s Note : This article originally appeared in part on poetryoutloud.org. From a competitive field of some 365,000 students nationwide, Kristen Dupard, a senior at Ridgeland High School in Ridgeland, Mississippi, won the title of 2012 Poetry Out Loud (POL) National Champion at the National Finals held in Washington, D.C., on Tuesday, May 15, 2012. With her achievement, Dupard also received a $20,000 award and her high school, Ridgeland High School, received a $500 stipend for the purchase of poetry books. She was also interviewed on thePBS Newshour. This marks the second year the Deep South has produced the POL winner. In 2011, Youssef Biaz from Auburn High School won top honors. 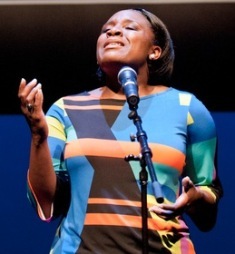 The second-place winner in the 2012 Poetry Out Loud national competition was Claude Mumbere of Burlington, Vermont, who received a $10,000 award. MarKaye Hassan of Logan, Utah, received the third-place prize and a $5,000 award. In addition, the 4th – 9th place finalists each received a $1,000 award, and their schools received $500 each for the purchase of poetry books. The other finalists were Samuel Opoku (Thornton, CO); Gwen Morrison (Marshalltown, IA); Russell Heitman (Hebron, NE); Jessica Kariisa (Raleigh, NC); Daphnee R. McMaster (Reading, PA); and Langston Ward (Spokane, WA). Read more about the 2012 POL National Finals. Photo of Kristen Dupard by James Kegley.